This picture taken on January 10, 2013 in Turku shows the ferry M/S Viking Grace belonging to Finnish cruise company Viking Line. Viking Grace is the world's first large passenger ferry powered by liquefied natural gas. 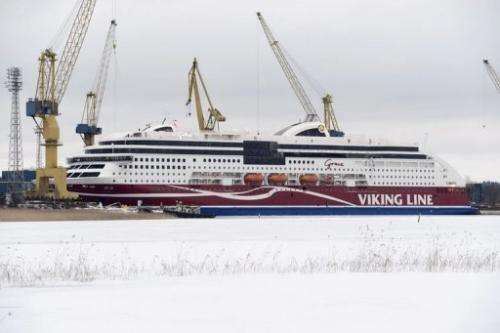 Finnish cruise company Viking Line took possession Thursday of the world's first large passenger ferry powered by liquefied natural gas, calling it an "environmental pioneer in the cruise industry." The M/S Viking Grace is 218 meters (715 feet) long and over 30 meters (98 feet) wide, can carry up to 2,800 passengers, and features 880 cabins. "By using natural gas the hazardous emissions will decrease to a minimum. Nitrogen emissions and particulates are reduced by 85 percent and greenhouse gases by 15 percent. Sulphur emissions are practically zero," Viking Line said. The vessel has a hydro-dynamically optimized hull shape that minimizes swell waves, and according to Viking Line also has "propulsion machinery that saves energy". The ship, which can sail at a speed of up to 22 knots will go into service on January 15 between the Finnish ports of Turku and Mariehamn and the Swedish capital Stockholm. It was built by STX Turku in Finland at a cost of approximately 240 million euros ($315 million). The STX Turku shipyard recently lost a one-billion-euro order to STX France from Miami-based Royal Caribbean International for a sister ship to its two top-of-the-line cruise liners. Since losing the order, STX Turku has asked the European Commission to probe French state subsidies given to STX France to help it clinch the order, to ensure they were in line with EU regulations. STX Turku, which employs 2,200 people, has also said it may have to cut hundreds of jobs and is currently in negotiations with unions.